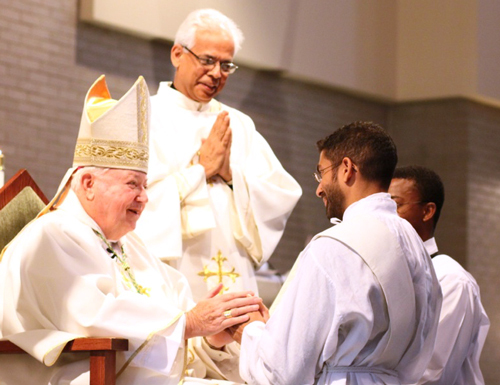 Father David Verghese, C.Ss.R., is the fifth Redemptorist priest to be ordained for the Baltimore Province in 2014. He was ordained Saturday, May 31, by Archbishop Emeritus Edward J. Gilbert, also a Redemptorist, at St. John Neumann Church in Annapolis, Maryland. Please pray for Father Verghese, the four other young men ordained this year (Fathers Joseph Thang Nhat Nguyen, Francis Xavier Quang Van Tran, Peter Linh Ba Quoc Nguyen, and Joseph Hung Duc Tran), and for all Redemptorist priests and brothers.